In September Shugen Roshi visited Garrison Institute in the Hudson Valley to co-lead a workshop with Dharma teachers Sharon Saltzberg and Pema Khandro. Hosted by the Lion’s Roar magazine the weekend workshop’s theme was Manifesting Compassion. Throughout the fall Roshi also continued monthly meetings with other religious leaders at the Woodstock Interfaith Council. 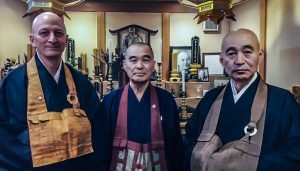 In October Roshi traveled overseas to Japan to visit Eiheji and Sojiji, the two main training monasteries of the Soto School, where he served as guest head priest in the traditional Zuise ceremonies to recognize Dharma transmission in the Soto lineage. This visit was a way for Roshi to acknowledge and celebrate the MRO’s lineage with our Japanese ancestors, a connection established through Daido Roshi’s teacher, Maezumi Roshi. Shugen Roshi was accompanied on his travels in Japan by Seido Suzuki Roshi (pictured with Shugen and Junyu Kuroda Roshi on bottom right photo). Seido Roshi lived at ZMM in the mid-1980s and has been a close friend over these many years. Also accompanying Roshi was Tash Esho Sudan (lower left facing page on far right), a Soto priest who also had lived and studied at the Monastery as a student of Daido Roshi. Junyu Kuroda Roshi is a Zen Priest and brother of the late Maezumi Roshi, and abbot of Kirigayaji Temple in Tokyo. Shugen Roshi also visited another historic temple, Toshoji, (lower left facing page, where Seido Roshi has been leading a traditional Soto Zen training sangha. A joyous dedication ceremony was held in early October, with Shugen Sensei and the residential sangha, at the new kitchen altar to dedicate the new kitchen as three months of renovations came to completion. This major renovation upgraded every aspect of the kitchen including plumbing, electricity, ventilation, lighting, counters, sinks, floors, and dozens of details large and small. The installation of the walk-in refrigerator and freezer will be completed last but not least, opening up valuable work space and reducing noise and excess heat in the main kitchen area. See more pictures of the new kitchen in Sangha News at mountainrecord.org. Arnie Taifu Sirignano passed away at Zen Mountain Monastery earlier this fall during the Peaceful Dwelling Intensive retreat, suffering a fatal cardiac arrest, despite the efforts of staff and EMTs who arrived on the scene. An early student of Daido Roshi, Taifu received jukai from him along with his dharma name Taifu (“Enduring Wind”). An active student for many years, he had just this past year reconnected with the Monastery once again, attending morning and evening zazen and the Sunday program on a regular basis. He was eager to re-establish his connection as a formal training student. 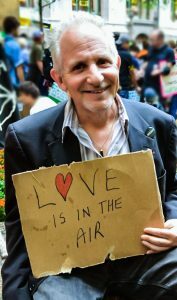 Taifu lived nearby in Lake Hill, NY, was a prolific artist and a social worker who volunteered on the Friday overnight shift for Family of Woodstock’s crisis hotline. A funeral ceremony and burial for Taifu, attended by family, friends and sangha was held at the Monastery on October 8, 2017. The Monastery’s annual Hungry Ghost Ceremony was held at the end of October with a special evening of liturgy. 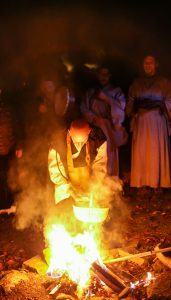 Resounding bells, drums, cymbals and the call of a conch shell led a sangha procession up the mountain path lit by jack-o-lanterns and flickering kerosene lamps to the outdoor chapel. Prior to the ceremony, Shugen Roshi described the liturgy as recognizing the Six Realms of Existence, specifically the Hungry Ghost realm, and invited each participant to offer personal dedications to those who have passed from this life. The ceremony included circumambulation of the Nirvana Fields cemetery and stupa, and a bonfire liturgy where all dedications are offered. The evening concluded with a gathering over pumpkin pie and cider. Sitting Tangaryo in September to become students of Hojin Sensei were Andrea Nieves, Michelle Sellars and Jean Ann Wertz. All participants passed through the five barrier gates to become formal Mountains & Rivers Order students. Joining residential training in September were Anjelina Hatty Cresse of Auburn, WA, Caroline Benish, Armonk, NY, and for two months Jess Plumb of London, UK. In October Anastasia Shyla of Toronto, Canada was granted a year of residential training. In October month-long residents included Daren Campise, New York, NY, Jacob Hite from Thailand, and Ashwari Skydancer of Crestone, CO, and for two weeks Elia Parker, Bluffton, SC. Monastery residents in November included Morgan Bryan of Columbus, OH and Hunter Pelligra of Hackettstown, NJ. Joining for a week were Jude Kushu Dinan of Troy, NY and Donna Shoshin Chester of VA. In November we also said goodbye to Margaret Taberna of Denver, CO who completed a year of residential training. New month-long residents at the Temple in September were Chris Yudo Abrahams beginning a three-month residency and William Lee for two months. In October, Vadim Galperin arrived for six months of residency, and James Busan Mannion began a six-month Temple residency staff position. In November, Stephanos Koulliasa began a six-month residency, and Daniel Latore began a two-month residency.